This is Independence Oaks’ best hike, a 3-mile loop in the undeveloped half of the park that includes climbing the tallest ridges and following the shoreline of Crooked Lake. Keep in mind the hike does include more than 100 feet of climbing along an old glacial moraine that forms the main ridge in the park. If that is too much for you or your family of hikers, then just walk Lakeshore Trail, an easy 2.4-mile loop that hugs the entire shoreline of Crooked Lake. 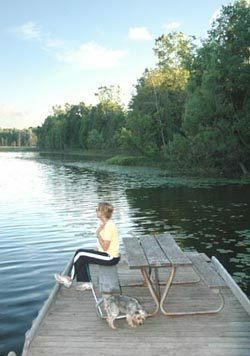 If it’s mid- to late summer, pack a rod and reel and try fishing for panfish here or at one of the many docks on the west side of the lake. Use a simple bobber rig with a leaf worm or half of a nightcrawler, which can be purchased from the park boathouse. Young anglers rarely will catch a “keeper” off the docks, but the action is lively. Begin at the Lewis E. Wint Nature Center where in the main parking lot is a trailhead with a map box marking the junction of Springlake and Rockridge Trails. Springlake leaves north (straight) and begins with a descent to a long boardwalk across a marsh. From this sea of cattails the trail climbs the ridge known as North Hill, descends briefly, then climbs again, topping out at a bench 0.5 mile from the parking lot. If the leaves aren’t too thick, you can view the entire marsh area, which stretches from Spring Lake to Crooked Lake. The trail quickly resumes climbing and then follows the ridgeline, rising and dropping with its crest, until reaching the posted junction with Oldfield Trail a mile from the nature center. Head down Oldfield Trail a few steps for a view of Spring Lake through a stand of tamarack. The small pond is a dying lake, slowly being filled in and covered up by the carpet of moss and bog plants that encircles it. At the junction Springlake Trail curves sharply away from the lake and begins a steady climb to the crest of another ridge known as South Hill. You follow the ridgeline for a short spell before topping out at a posted junction with Ted Gray Trail. You are now standing at almost 1200 feet, more than 150 feet above the lake. At this point Springlake Trail curves to the southeast and begins a steady descent from South Hill. A more scenic route is to follow Ted Gray which also makes a sharp descent off South Hill and then follows a boardwalk through a scenic marsh before merging into Springlake Trail in 0.7 mile or 2 miles from the nature center. 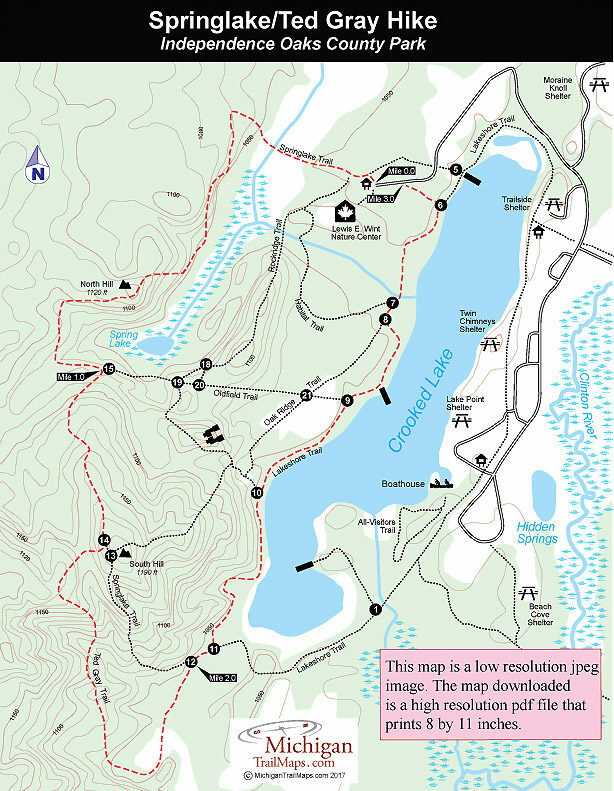 You quickly come to a view of Crooked Lake and a junction with Lakeshore Trail.. Head left (north) at the junction. Lakeshore Trail skirts the south end of the lake, a small, shallow bay that attracts both waterfowl and anglers in the spring. The lake supports bass and northern pike but is best known for its panfish. At one point the trail climbs to a picnic table on a small knoll overlooking the lake, a great place for a snack. About 2.5 miles into the hike, you reach a floating fishing pier. If it’s late April or May, have them search the clear water for the sandy craters of spawning bluegill or other panfish. Find one of these underwater “dishes,” and usually the protective mother is nearby. From the fishing dock, Lakeshore Trail continues north and stays within view of the lake; Habitat Trail merges into Lakeshore Trail from the left. Shortly you’ll cross a bridge over the creek from Spring Lake, and Habitat Trail will split off from Lakeshore Trail. Follow Habitat Trail to the left, and in a few hundred yards you’ll be back at the nature center parking lot. The park is open year-round from a half hour before sunrise to half hour after sunset. Lewis E. Wint Nature Center is open daily 10 a.m.. to 5 p.m.. Tuesday through Saturday and noon to 5 p.m. Sunday and holiday. Contact the park office (248-625-0877) or the Lewis E. Wint Nature Center (248-625-6473) or the Oakland County Parks website(www.destinationoakland.com).